Part-II: Hastier Than hastiest, Census Conversions. Soon after posting “Hastier Than Hastiest: Conversion of Census” I was absentmindedly looking at the Graphic from Indian Express Column, “Census, Christians, Conversions“. At the back of the mind there was a nagging doubt about what is the correct period in second table of Average (Population) Growth rate(Log)? Is it 1991-2001 as the author’s comments seemed to suggest when he wrote about the faster deceleration in Muslim’s AGR_L when compared to Hindus? Or is it 1991-2011 as the title to the table seemed to suggest? Then it occurred that it was possible to compute independently AGR_L figures for all the three periods –1991-2001, 1991-2011, and 2001-2011 since the graphic gave religion wise population figures for 1991, 2001 and 2011 census. Please see the Blue portion in the following table for AGR_L for the 3 periods. The AGR_L has been presented accurate to 2 decimal places and those in the column “1991-2011” tally with the corresponding figures for 1991-2011 in the graphics. Therefore, the issue of “period” stands settled. 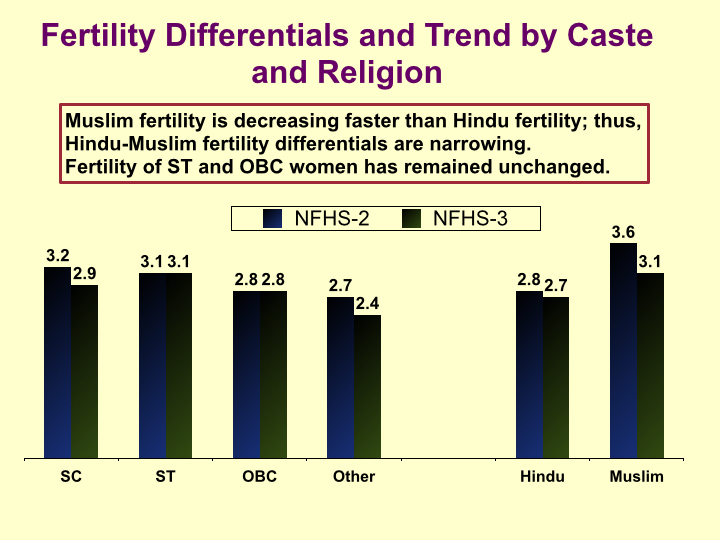 The green portion in the table below gives the religion wise Fertility Rate as given in the graphic. 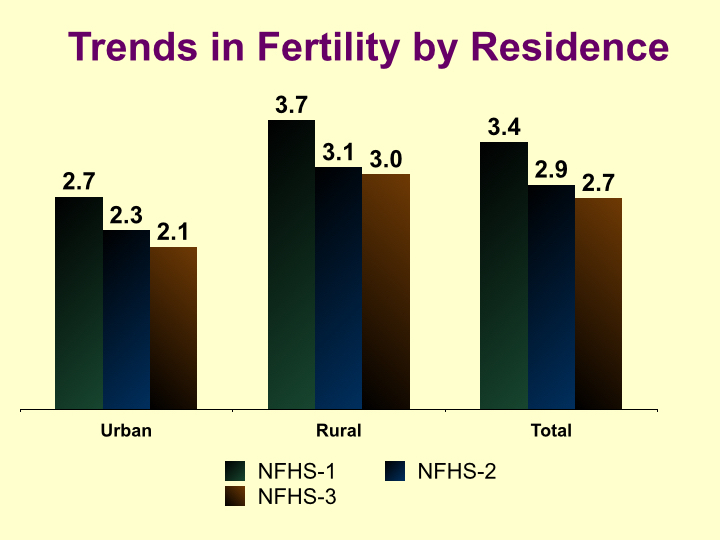 The graphic claims that the Fertility Rates have been taken from NFHS. Now NFHS stands for National Family Health Survey. The Ministry of Health and Family Welfare appointed International Institute of Population Studies [IIPS] as the nodal agency in 1990 to conduct the NFH Surveys. Until now only 3 rounds of NFHS have been completed and the 4th round is currently in progress. A worthy aside to mention is that there is an EPW article criticising the manner in which NFHS-4 is being conducted in Karnataka. NFHS-1, NFHS-2 and NFHS-3 were conducted in 1991-92, 1998-99 and 2005-2006 respectively. First round began when the 1991 census was conducted, but that is not the case with the other two rounds. It is a mystery therefore from where exactly and how the “Fertility Rate figures” have been reported by the columnist for 1991, and especially for 2001 & 2011. The “mystery” becomes more confounding when one compares these figures with say tabulations made in the NFHS-3 power point presentation. See the two slides extracted from it below. For 1991-2001: The simple average of 1991 and 2001 fertility rates. For 2001-2011: The simple average of 2001 and 2011 fertility rates. For 1991-2011: The weighted average of (1991 + 2 x 2001 + 2011) fertility rates. See the Fuchsia portion in the table above. Population Growth rate = Fertility rate – Mortality Rate + Net Cross-border migrations. Mortality rate = Fertility Rate – Population Growth Rate. The mortality rates [see Yellow portion in table above] were thus worked out using the data in Blue and Fuchsia coloured portions in the table above. However, a glaring abnormality stares in the face. The total mortality rate as well as mortality rates for the 4 religious communities seem to keep rising over the three censuses. This is prima-facie absurd. This raises grave doubts about the Fertility rates data used by the columnists. And unless he takes into account correct Mortality Rates, his “Conversion Conjecture” remain just that, a conjecture or a wild speculation.